There is no shortage of opinion pieces or expert commentary making the case that Kiwis are financially illiterate. Apparently we’re not good with savings, we don’t plan for the future, and we do not take even simple actions (like switching out of our default KiwiSaver funds) to optimise our future financial security. But are individuals wholly to blame? The message that individuals will need to take greater personal responsibility for the retirement savings is not a breaking news story. Raising the nation’s financial literacy has been seen by policymakers as a priority for ensuring the country is prepared for the fiscal challenges that lie ahead. It is my generation who are told that the future costs of New Zealand Superannuation (NZS) are unsustainable. We are told that NZS will not be available, or will not be available in its current form, by the time we retire. Change is inevitable. If that is the case, then what is stopping individuals and government from making those necessary changes? If suffering elderly poverty or being in dire fiscal straits is not a great enough incentive to act, what is? It is my contention that both individuals and government lack the incentives to take greater responsibility for their future financial security. And this problem has no easy solutions. A highly financially literate person might not save a great deal for retirement if they have every reason to believe that NZS or some other form of welfare safety net will be available to them. Such a person would simply be rationally responding to incentives. People might also not be engaged with their KiwiSaver accounts if they believe the government’s default settings will already reflect their best interests. Worse, those with KiwiSaver might become complacent that their future retirement is already being taken care of, without checking in on what lifestyle their future KiwiSaver yield is likely to afford. And as for the Kiwi obsession with housing investment, well, that is hardly grounded in financial illiteracy. The tax system’s favourability towards housing compared to other investments, combined with the government-regulated constraint on housing supply, makes housing investment a rather financially literate option. I wouldn’t be the first to observe that messages and incentives matter. 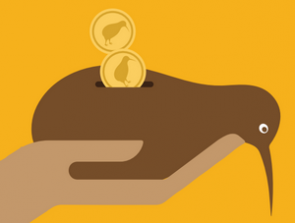 In Interest.co.nz’s own analysis of how much individuals will need to save for their retirement, it includes the caveat “You need to focus on what you need to do. Try to avoid thinking about the fact that the public purse will be available for those who either can't or can't be bothered.” In other words, personal responsibility requires ignoring current public policy settings and incentives structures. But the reason for such mental gymnastics, which the same article acknowledges, is sound: we must protect ourselves from changing public policy positions. Let’s leave aside the specifics for now on exactly what needs to be done. While there is some contention about what policy changes are needed and when they should take place, there is much less contention that the future fiscal costs of healthcare and NZS will put pressure on the public purse. And if governments continue historic spending patterns, Treasury projections suggest debt financing costs could soar from 1.6% of GDP in 2015 to 11% of GDP in 2060. That proportion is greater than the possible future costs of NZS (7.9% of GDP in 2060) and healthcare (9.7% of GDP in 2060). Maintaining an economy of good productivity growth and stable debt levels will protect the financial security of New Zealanders under a range of possible future circumstances. The problem then is not that NZS is “unaffordable.” In fact, NZS changes to NZS are not “inevitable.” It is a matter of opportunity costs. If voters demand universal NZS as it exists today, and governments are so inclined, they will find a way to finance it. This can mean cutting spending in other areas, raising taxes, or taking on more debt. Change will only be “inevitable” if voters demand it or the country’s debt spiral leaves few other options. Governments, after all, want to get re-elected. Governments also face less incentives to get decisions right, especially when the outcomes will not manifest themselves until well after their reigning term. When New Zealand has one of the lowest elderly poverty rates in the world, and a low rate domestically (the material deprivation rate for older New Zealanders is 3%, compared with 11% for the total population), is it any wonder why retirement savings and superannuation reform do not make it to the top of the government’s priority list? It appears we’re stuck in a bit of a bind. Individuals lack the incentive to take greater personal responsibility for the retirement savings because of the welfare safety net that exists. They also lack an incentive to actively vote away their future entitlements. Meanwhile, governments lack the incentive to retract NZS entitlements because of the political imperative. And even if changes were made, there is no guarantee that incoming governments will not offer greater and greater benefits to secure their electoral success. Yet it will be individuals who suffer, and particularly younger generations, from government inaction. Even if future generations received the same NZS entitlements that exist today, they will not be protected from economic shocks. NZS is vulnerable to the economic conditions of the day. The fact that a significant part of the population are wholly reliant on NZS as their source of income, is not a sign of a financially secure population. Individuals also benefit from having a long lead-in time, so that they can adjust their savings regimes accordingly. If governments wait until NZS is truly unaffordable, economic reform will have to be sweeping and it will be painful. So who are the real financial illiterates? After all, governments are not (always) good with savings, don’t plan for the future, and sometimes do not take even simple actions to optimise future financial security. Rather than focusing on the flaws of individuals, governments might do better to explore their own behavioural biases. *Jenesa Jeram is a policy analyst at The New Zealand Initiative. The New Zealand Initiative is currently working on a retirement savings project, to be released later this year. It will focus on how government financial illiteracy causes many of the barriers individuals face when saving for retirement. I would counter - you can't help someone that doesn't want to help themselves. Can't say that the government doesn't help themselves - recently learnt that MPs get $2.50 for every $1 they put into a retirement fund. Helping themselves is clearly at the top of their priority list. Now to get them to do it for every one else! Should take some pressure of Super payments! oh and I forgot - they get full retirement benefits after just 9 years as an MP....... if only! The government, any government that is, would save a heck of a lot more money by wasting a heck of a lot less money. Last National lot started out stating that’s what they were going to do. Ended up just as bad if not worse than others . For instance Ministry of Health & MBIE headquarters inexcusable blowouts, and don’t mention the blasted flag exercise! If the average person actually understood where the taxes all went, I think they would vote quite differently. It horrifies me just how much we spend. http://wheresmytaxes.co.nz/ provides a good start. Yes, if ever there was a group that was only too keen to help themselves. The only competitors they have in that regard are the councils. I'm not stuck in a bind. I'm weighing up my options for early retirement. Should I spend my kiwisaver on paying off my mortgage faster (FHB scheme), and subsequently put my kiwisaver contributions on indefinite hiatus, in favour of building my own portfolio (via InvestNow or Superlife etc)? Or should I stick with conventional kiwisaver? The reason I ask is: Is there a disadvantage to forgoing the yearly government kiwisaver contribution, and going all in on a private portfolio? Anybody who is underemployed, unemployed or self employed and has $1040 available each year and who does not put this into Kiwisaver is ummmm, how do I put this? It's true, the difference between contributing the minimum and not contributing at all from age 25 to 67, even with a conservative rate of return of 3.5%, is a whopping $50000! Assuming the government contribution persists as it exists today, for the duration of the plan. Better to have some skin in the kiwisaver game after all, especially as everyone else in NZ will be making use of this feature. Are you rich enough to turn down an instant 50% gain? My employer matches my contributions, so I max this out (3%). Money above this gets saved elsewhere so I can access earlier. If you're aiming for early retirement you're presumably saving significantly more than 3% so will have another pile of cash to run down/live off before the kiwisaver component becomes accessible. I think in most circumstances it's crazy to turn down free money from the government and/or employer. it's so good to hear Jock, some body taking responsibility and doing the thinking "I'm not stuck in a bind. I'm weighing up my options for early retirement." But the need is determined not just on what the government incentivises. Folk need to be ploughing cash into kiwisaver/mortgage reduction/other investment, even if the government withdrew all subsidies. My understanding is that the Government Contribution of up to $521 pa, is only for first 5 years. "Member tax credit ceases when the member reaches the age of eligibility for NZ Super (currently 65) or has been a member for 5 years, whichever is the later"
I think that the 5 year limit is only relevant if you join after 60, otherwise you receive the tax refund until you are 65. In other words, everyone receives the refund at least until they are 65. Good. I'm turning 65 later than having been in it for 5 years. Bonus. The big uncertainty is whether a future govt will means test NZ super.There is no mention of it at the moment but as soon as there is an inkling of this, people will get very creative with hiding their wealth.Or indeed aim to not become wealthy. eg Use Kiwisaver to buy that nice luxury SUV monster. I expect they'll do it by stealth e.g. TOP policies. So we can expect "Equity Taxes" on rental property and owner occupier....? From tax working group. It's been made much, much harder to invest money than to borrow it from a lender. Lenders seem to have unlimited funds for marketing (oh look! it's Alec Baldwin!) and a really good relationship with the regulators. You can stroll into any mall and stroll out again an hour later having got yourself into a bowel-loosening, lifetime of debt really easily. Nobody conducts a serious fact-find, no-one is personally responsible if you get suckered into a 4-year interest free* finance deal by a desperate sales guy who is behind on his targets. Labour's proposed "wealth tax" would kill any incentive to save money for retirement. It also has the potential to kill business in New Zealand. Without the ability to accumulate wealth, there will be no investment. We would go the way of Zimbabwe. Putting in a land tax again and dropping personal and corporate income taxes would incentivise saving and productive investment rather than all money simply flowing into housing. My thoughts have been that funding retirement (NZS) should be a similar setup to ACC (call it insurance against old age loss of income). Take the burden off the young as there risk of reaching retirement age is lower than for an older person. Also its pointless having a massive personal kiwisaver account if you drop dead at 60. Governments change often, along with philosophies & agendas. The best bet really is to plan for retirement as soon as you start working. The challenge is to get millennial to see past their new shiny phone & plan for the future. We personally have been talking to our kids about the importance of finance & retirement from very young ages (5 yrs). The main message we try to get through to them is that you have to plan to look after yourself, not hope that some Government in the future will do what is best for you. Isn't this another argument about who gets which piece of the pie, ignoring the fact that the process of de-industrialisation has made us slowly and steadily poorer? We hide from the effects of de-industrialisation by borrowing more, selling residency, and promoting low wage occupations such as Tourism. This was aided by the pro-banking lobby in the Western world, which held out that we could all be better off if we only borrowed more. So we borrowed more and invested in nice, but low productivity assets like houses, not high productivity assets like mines and specialised manufacturing ( the dirty, difficult stuff). Since 1971 we have been engaged in a steady decline as we de-industrialised and gave priority to the nice things that money can buy, rather than the more difficult, and often dirty, process of making things that others wanted to buy. The exact opposite of Japan, South Korea, Hong Kong, Singapore, China and Germany. Is this the financial illiteracy we are all guilty of, individuals and governments alike? That we need to earn more as a country than we spend? Financial literacy is effectively an individuals responsibility but Governments have a responsibility to provide platforms for someone to gain such literacy. Overall, its in everyone's best interest to have a better understanding of the finance world. Most people live in the work, spend, consumer cycle, with no thought to planning beyond the weekend. As the population of NZ grows, our current view of finances is not going to help us have a well balanced society. It will simply become a society of the haves and have nots.